...stop chasing them around the room and across the game board. 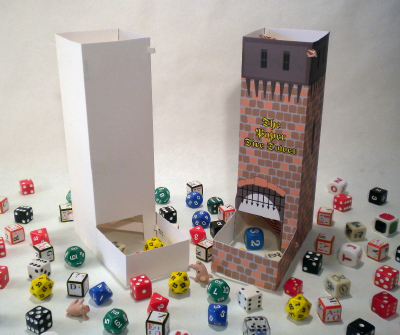 The Paper Dice Tower is a fully functional dice tower that you can make yourself with a few pieces of card stock, some tools, and the pdf provided. It's a nice light weight, easy to store dice tower that folds flat and can be stored inside your favorite game or in a 6x9 envelope. Pop it open, place in the 2 support beams, and you are ready to roll. You can use my graphics to make one that looks like the one on the right...or make a blank one like the one on the left and let your creative side roll. Either way enjoy. A nice little review about paper dice towers.